If the water added over max line, the mist will be very thin(less water, more mist). To prolong the lifetime of the item,please keep it dry when storing. If the ultrasonic wave chip was polluted, it may cause error action or default. ● Noise Level: Lower than 36dB. It works without beeping. 2.Please contact us if there are any problems with your purchase, our service team will response to you within 24 hours. 3.We offer to give full refund or send a new replacement for defective or damaged items. Customer satisfaction is our top priority, so we will try our best to give the best solution. 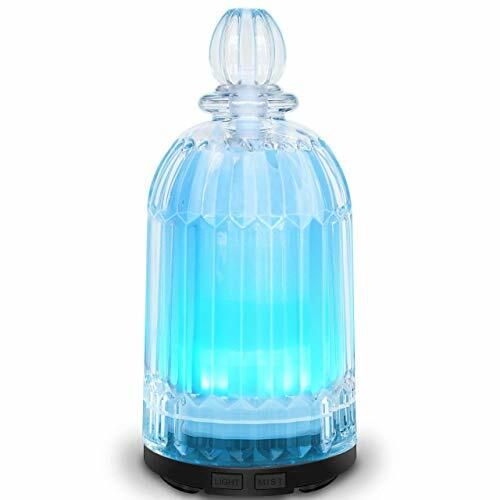 【Beautiful Perfume Bottle Design】This glass diffuser which fits into any decor can be a very beautiful display in the house and office. It not only adds moisture to your house but also creates a soul-soothing atmosphere there. A wonderful gift for anyone who will need a diffuser. 【7-Color LED Light】The light has 7 kinds of colors. You can set it to one specific color or have the 7 colors rotating on its own. You can also turn off the light as you want when it is in operation. The soft and pretty light creates a special visual environment and gives the whole room a refreshing feeling. And it can be used as a extra night lights for small needs in the dark. 【Automatic Shut Off】 With anti-dry protect system, it will automatically turns off when running out of water, which is nice because you can fall asleep with it on or leave it on when out running errands without worrying that it will continue to run and save the energy as well. 【2 Working Modes】 The diffuser can hold about 80 ml water. It has a built-in timer in two modes: Continuous mode: Mist comes out constantly, and works for 4 hours; intermittent mode( mist 15 seconds on and off) and works for 8 hours. Different mist meets different needs. 【Silent Operation】With advanced ultrasonic technology, this diffuser operates without any making any noise. So you won't be disturbed when studying, sleeping or working. View More In Oil Lamps. If you have any questions about this product by COSVII, contact us by completing and submitting the form below. If you are looking for a specif part number, please include it with your message.